We use our Musikal Collection to promote the Dreamers, our Global iConic Signature Brand. Our Musikal Tracks and Lyrics cover 3 different Genres: The Speaking Words' Theme, The Singing Theme and the Rap Theme. Our Music covers causes i.e. political, socio-economic, multilingual and cultural areas. 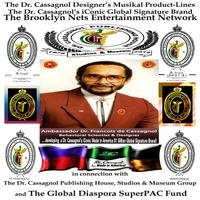 Major portions of our profits from these songs will go directly to our US Non-Profit Tax-Exempt Organization, helping the Global Diaspora and the Dreamers in the United States of America thru our Dr. Cassagnol Foundation and The Global Diaspora SuperPAC Fund in collaboration with the Brooklyn Nets Entertainment Network, a registered mark of Dr. Cassagnol Institute of Research, Inc..